Claims about Target Sale Prices, Markdown Schedule - Fiction! - Truth or Fiction? Claims about Target Sale Prices, Markdown Schedule – Fiction! Sale stickers at Target can be used to determine whether an sale price will be lowered more in the future, and Target uses a regular weekly schedule to mark down prices in different departments. It’s not true that Target sale stickers reveal whether an item will be marked down more in the future. And the claim that Target shoppers can expect prices in different departments to be marked down on the same day each week is also false. 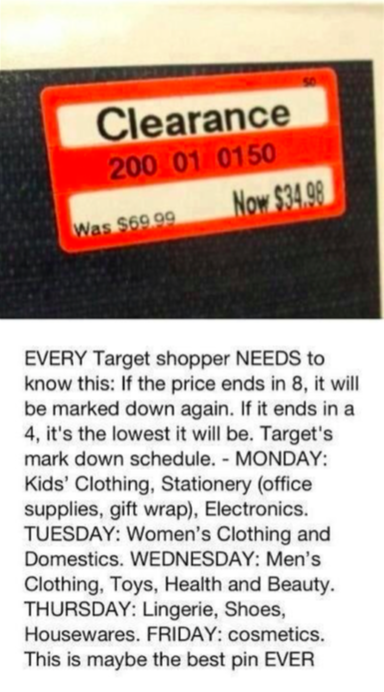 “EVERY Target shopper NEEDS to know this; if the price ends in 8, it will be marked down again. If it ends in a 4, it’s the lowest it will be. The eRumor only makes claims about the prices of clearance items. Since clearance items are often being discontinued, the amount of inventory on hand should be able to help shoppers determine how long a clearance sale will last, and whether the price could be lowered again in the future. CDC Says Mothers Shouldn’t Breastfeed to Make Vaccines More Effective – Fiction! DNA Test Confirms Dead Homeless Man was Elvis Presley – Fiction!